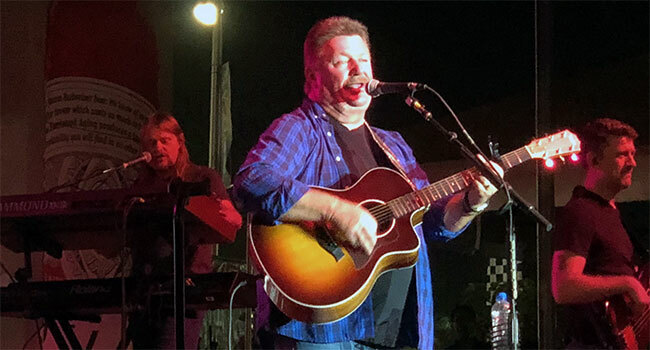 If you’re a 90’s country fan, you’re most likely familiar with Joe Diffie. The country crooner brought his string of hits — and then some — to the Kern County Fair in Bakersfield, CA on Saturday (Sept 29th). Diffie’s hits date back to the late 80’s — the first six hitting No. 1 — and the large crowd knew them all! Diffie pulled a few surprises out of those empty pockets during the night. He and his band sang the chorus of “1994,” a song Jason Aldean released about the singer a few years ago. As his manager highly suggested, Diffie responded to the song with “Girl Ridin’ Shotgun,” a hick hop track with D-Thrash of Jawga Boyz. Diffie covered the singing parts on the studio recording, but rapped and sang it live, which earned him a large applause. Another nice surprise was an ode to old country songs. Diffie covered Charlie Rich’s “Behind Closed Doors” before going into George Jones’ “You’re Still On My Mind” a shortened version of “He Stopped Loving Her Today.” The crowd cheered loudly as Diffie sang some of country’s most powerful and notable songs from his childhood. “Good Brown Gravy,” an album track from Third Rock From The Sun, was also performed. The uptempo rockabilly tune was a pleasant surprise and had the crowd on their feet. Diffie finished the night with two of his biggest hits from 1993 — “Prop Me Up Beside The Jukebox (If I Die)” and “John Deere Green,” with a spot on impersonation of Willie Nelson during the former’s intro. As “Green” finished, Diffie thanked the crowd and left the stage. His band soon followed. They all returned moments later to perform “Bigger Than The Beatles” as the lone encore song before saying goodbye a final time. Diffie’s vocals were strong and polished. If you’re a fan of 90’s country music, you must see his show at least once in your lifetime. He didn’t put his guitar down once until he left the stage. He swooned and swayed all night giving fans what they came for which was nostalgia for some great country music.